San Jamar KLP200 Kleen Plugs are designed to plug liquor bottles and beer taps, keeping them safe from contamination and free of pests like fruit flies. 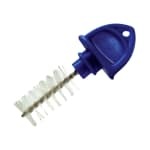 These plugs are also suitable for sealing and protecting waste drains at beverage stations. This item packages 5 San Jamar KLP200 Kleen Plugs in a blister pack.